Anyone interested in helping me develop VDS style syntax in Powershell? I'm doing it either way, but I think I could do it better with help. It's already moving right along. Let me know if there's any interest. Oddly, Powershell and VDS are very similar in many ways - after you get past some sticking points. Reply back if you're interested. I've only tried to use powershell once but ended up doing what I needed in VDS. 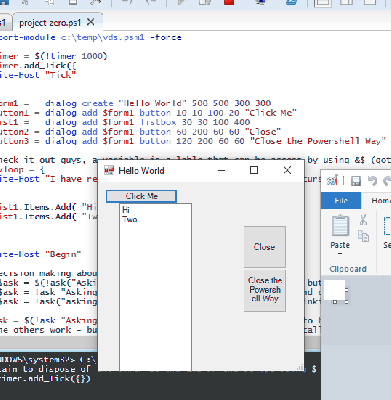 I will have a look at the Powershell ISE and your Visual DialogShell as your excellent notes and inline comments on Github make it all seem easy. I just realised what your username means. 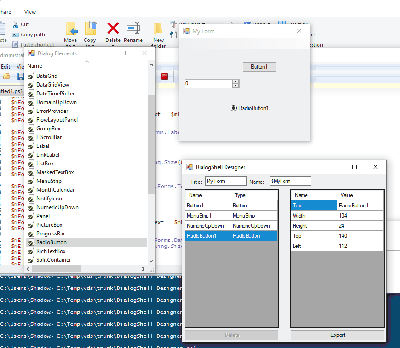 It's a little early to show off advanced scripting, but something like this will be in the template soon. info "Hello from $(dlgtext $this)"
It's not Visual DialogScript, and it's not Powershell - it's something new and awesome. #VDS Function - classic syntax equivelent. #VDS Assertion - A function that won't work within another call, but works to assign an object. #VDS Command - classic syntax equivelent. #VDS Directive - a command that will work within another call. #The directive was processed before the command. #The directives executed in order. info "$(substr Brandon 2 4) assignment skipped"
Really nice work. I like how quickly you developed the application! I'm not just interested in what I can learn from powershell, I'm also interested in the lessons we learned so long ago in DialogScript that we take for granted that are available in powershell, but the powershell users are struggling to comprehend. The more I work on this, the more I'm convinced it needs worked on. Currently DialogShell is fit for beta consumption. The state of powershell is sorta weird right now. Windows Powershell 5.1 is part of the Operating System currently. Powershell Core has moved on to be cross platform, and currently does not support Windows Forms, however, I feel this is primarily because .NET Core did not support Windows Forms. .Net Core 3.0 beta started supporting Windows Forms about a week ago, and I believe Powershell will follow suit sooner or later. By the time Windows Powershell is out of support, I believe Powershell Core will support windows forms, probably requiring some code adaptations. At that point, I will make those adaptations unless someone else beats me to it. DialogShell was built on Windows Powershell, and other than windows forms, also works in Powershell Core. Yeah, I first became aware of the possibility a couple of years ago to create forms applications in powershell, but most of the examples I came across were super convoluted. Boiling things down to a simple structure that is easy to remember in Powershell is a chore, even one level up from the DialogShell module. Verb-Noun is a principal of Powershell, which is pretty cool, except that every command seems structured around the material component level ~ meaning the commands of powershell are made functional by combining them into functions. Now this is all relative of course, virtuoso's of Powershell would state that the level of abstraction proivided by a language like DialogScript is undesirable. But following the Law of Demeter ~ which is what made Visual DialogScript so powerful, is also the primary principal of DialogShell (yet also when it comes down to it, we can edit the module). When we work with only with what we need to know to be creative, it allows for more possibilities and eliminates tons of code debugging. There's an absolute mountain of work to be done. I've conquered a molehill. Import Module declaration required as first line of script.